Give these spicy carrot muffins superior moistness from unsweetened applesauce. 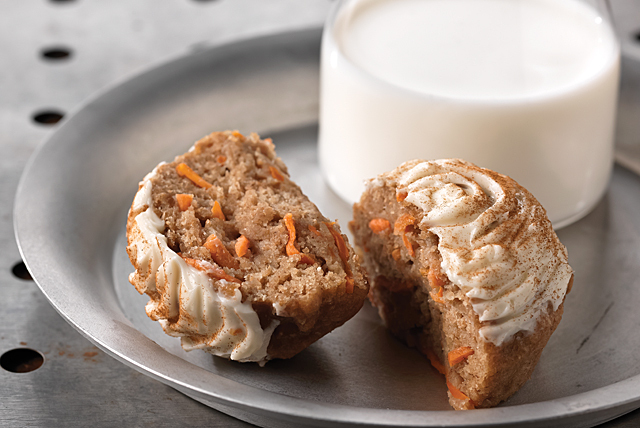 Pretend you're eating carrot cake with these Carrot Muffins! 1. Combine first 4 ingredients; set aside. Whisk egg and oil in large bowl until blended. Stir in applesauce, brown sugar and 1/2 tsp. vanilla. Add dry ingredients; stir just until moistened. Stir in carrots. 2. Spoon into 12 muffin pan cups sprayed with cooking spray. 3. Bake 15 min. or until toothpick inserted in centers comes out clean. Cool in pan 5 min. Remove to wire racks; cool completely. 4. Mix reduced-fat cream cheese, powdered sugar and remaining vanilla until blended; spread onto muffins.